It is all About the Blog! I have always wanted to write. I realized there is a discipline in writing novels that I don’t have. I am also dyslexic, in my younger days I went at least twice a week to the children’s hospital to get the issue ‘corrected’ while I can see my letters and numbers straight I don’t believe one ever becomes un-dyslexic so writing is that much more of a challenge, but of course not impossible. I’ve made many attempts to sit and write, but always, after a few pages the words fall flat, all the character’s sounded the same, they all sounded like me. If I, the writer feel they are flat, why would anybody want to read them? Despite everything there was/is always the desire, that belief that if only I could find the right medium, the right angle then I would be able to write. In high school I wrote two papers that I was really proud of. One was a letter to my mother. We had a substitute teacher who had no control of the class. In my letter I wrote about the chaos that was unfolding around me. My mother told me that in reading my words she felt like she was there with me. Of course that is what she is supposed to say, she is after all, my mother. But a year or so later I heard her talking to a friend about that letter and how, while she was reading it she felt she was there with me. Those comments have always stayed with me, fueling the fire to write. In high school I had a very strict English teacher Mrs. George. She was only really interested in the ‘A’ students. Each year she would take a handful of students to Stratford-Upon-Avon, the birthplace of William Shakespeare. Only the best of the best students got to go. Mrs. George always had her nose in the air, her half glasses balanced on the tip of that nose. If you were one of her favorites you could do no wrong. And how those ‘A’ students loved her. If however you were part of the majority and simply didn’t measure up to her strict standards then she only spoke to you if she absolutely had too and then she would not talk to you, she would talk down to you. I was nowhere close to an ‘A’ student and therefore I was just an annoying blip on her radar that she had to deal with every once in awhile because it was her job. My big assignment for Mrs. George was to write a report on Steinbeck’s ‘The Grapes of Wrath’. I knew there was no way I was going to be able to write an acceptable report for Ms. George. Knowing I was going to fail I decided to fail with style, I wrote the entire report in the vernacular of Tom Joad. A few days later she handed us back our reports. She walked up and down the aisle of desks and placed the reports on the respective desks, making comments on each one, both good and bad. She stood in front of my desk for a moment and did not hand me back my report. Instead she simply said, ‘see me after class’ I heard my friends snicker. Sure most of them failed the paper. I however, obviously failed in epic style. She ended up telling me that she never had anyone try to write a report the way I did. She handed me my paper and there on the top was an ‘A+’ she congratulated me, she went as far to say that she never thought I would pass. Mrs. George told me that by far it was the most entertaining report she had ever read. I have never forgotten those words despite the fact that the next day I was once again just an annoying blip on her radar. Yet, I never understood that you can write something aside from a novel. For me it was always a novel or nothing. While the desire to write never went away I couldn’t seem to learn the lesson Mrs. George and my Mother was trying to communicate to me. Having reached my mid forties I took a look back at my life and realized I have experiences, experiences I can write about. I can write about the world around me as it is happening just like that letter to my mother all those years ago. I could write about my past experiences just as I wrote about the dust bowl through the eyes of Tom Joad. Best of all I don’t have to write a book, I don’t even have to write short stories, character development is easy because I am the character. The internet makes it possible to write as I feel when I feel, I don’t have to rely on anyone else to ‘get it out there’ I could blog! In the early days, those that came before the magic store my father was in the fruits and vegetable business. It was an import export business he inherited from his father. We had an attached garage. I was in the basement (where eventually the magic shop would go) and I heard the garage door go up. Just as I got to the end of the short hallway my father came through the door with a husky puppy in his arms. I believe my father got Misty from a farmer with whom he did business. I am probably not the one to tell this story, I was very young at the time and I don’t remember everything as clearly as others might. But alas it has been hinted, more than once, that I should write about Misty, so here we are. 1971: for those of you taking your socks off trying to do the math, I was six. Misty was a typical looking black and white husky. She had one blue eye and one brown. 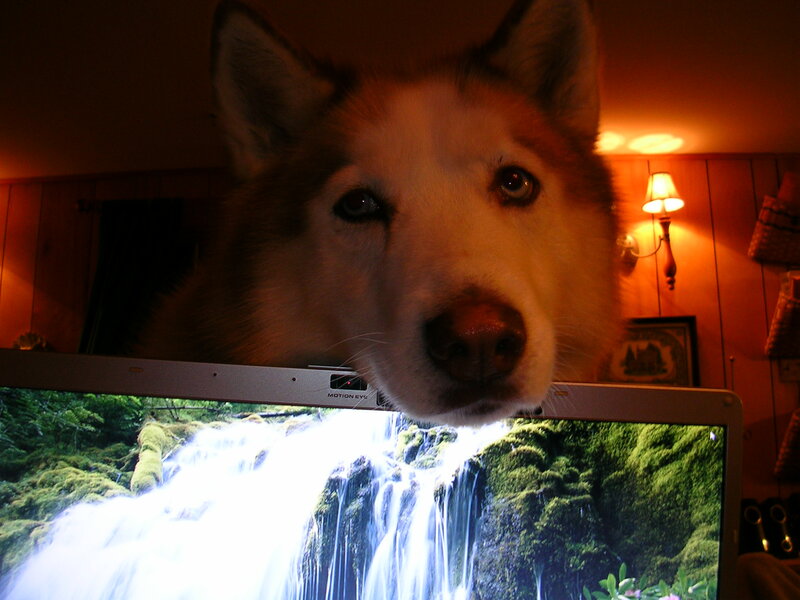 Like most huskies, Misty was trouble. My folks started off trying to paper train her. They covered the entire basement floor in newspaper and put the puppy in the basement. Misty found a spot where the corners of the newspaper overlapped, she spread them apart and pooped directly on the floor. That alone should be a lesson to anyone thinking about getting a husky, they are really smart and will try anything to undermine what you want them to do. My mother tells the story of the time Misty was getting a treat and as my mother tried to take the treat back Misty growled and bared her puppy teeth. While cute at the time my mother realized that in a year or so that may not be so cute. I don’t know how my mother corrected the behavior, but she (Misty, not my mother) never growled at me. Every day I would walk Misty while waiting for the carpool to take me to school. By walk I mean I would stand outside on the lawn with the dog and when the car came my mother would take the leash. For those of you who are un-aware huskies are really strong dogs and it just so happens they really like to pull. One day the car arrived to take me to school and Misty simply jumped into the car dragging me along chaos insued. One adult in the driver’s seat a few kids in the back and a rambunctious husky puppy jumping all over everything. The next day it was decided that it would be best not to have the dog out when the carpool arrived. That decision was in vain as the next day the car never arrived. For years after I thought Misty was a magic dog, no Misty, no carpool. If only it were that simple! Back in the early 70’s we used to get snow! And I mean snow. That year it was so deep we had trouble opening the door, we had to shove Misty out of a second story window so she could go out for her walk. We also rented a county house. Misty used to help us dig our snow forts. And I have a very vague memory of Misty pulling us around on a sled. It turns out my eldest sister was allergic to fur and feathers. The allergy was so severe the only option was to give Misty up. My father says he put two advertisements in the paper one for the dog one for my sister, the dog got the first response. We are reasonably sure he was joking about the advertisements. Reasonably! One thing was certain. Everyone loved Misty. The kids on the block, even the other dogs on the block, Princess, a samoyed that lived down the street was one of her best dog friends. I’m pretty sure the girl down the block who used to babysit only did so because of Misty. When Misty finally found a new home I used to have horrible dreams, in this particular recurring dream Misty was simply hiding somewhere, playing a game. I’d wake up in the middle of the night and look under my bed I’d sneak out of my room and it was only when I got to the living room did the reality of it sink back in. Misty was no longer there. In another dream my friend down the block had found her and was holding her for me. Boy was I disappointed when I woke up. Later that day my friend was outside on our walkway, (we all used to gather there and play CHAMP, a game with a ball). I couldn’t get past my dream even though I knew it was a dream. He must have thought I was nuts when I asked him if he had Misty. But I had to ask. My mother took it the hardest. My mother was the one who looked after Misty the most. You can barely mention Misty’s name without my bringing my mother close to tears. Lucky for us Sequoia doesn’t resemble Misty and doesn’t bring out that reaction. Maya, Sequoia’s only dog friend is a black and white husky. Not too long ago my folks were in town and we had a few friends over including Maya and her family. Sure enough there was a tear or two shed when Maya walked up onto the lawn. 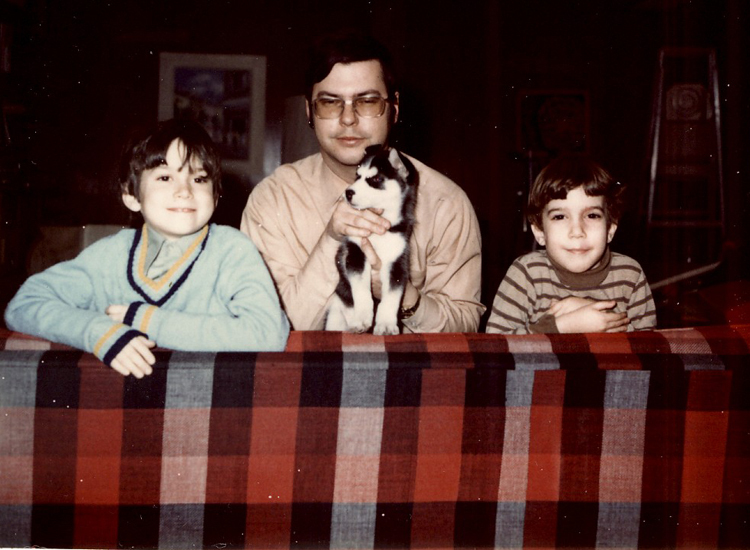 Years later, whenever the conversation of pets surfaced my mother would say no, because she is the one that ends up looking after them not us. So no, we could not have pets. Years later we learned the truth. My mother would not let us look after Misty, she knew we had to give her up and she didn’t want us to get any more attached then we already were. My mother was trying to spare us what she eventually had to endure, because that is what mothers do. When my wife and I first decided to keep Sequoia I knew I had to call home and tell my folks. As I watch Sequoia getting older, and I see her slowing down, I hear those words, I hear them every time I see Sequoia struggling to leap into the car, or ever so slowly get down from the couch, yes there are times we have to give them up, yes they get older, yes they die, and no, it is not fair!